Some awful news out of South Africa as authorities say 27 people were killed in a Thursday night car crash when an apparently out-of-control semi truck slammed into several cars at an intersection. The accident was caught on a dashcam. News24 reports that the driver of the truck has been charged with culpable homicide and reckless and negligent driving. 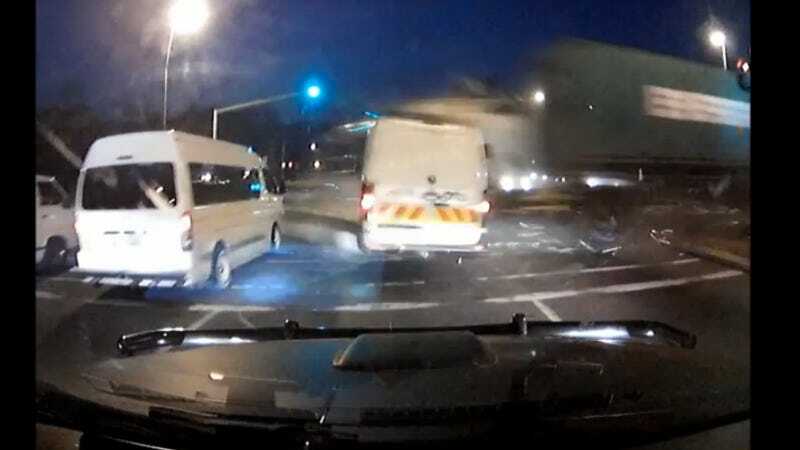 Around 7 p.m. Thursday, the truck crashed into four full taxis and a Volkswagen Golf at the intersection of Fields Hill (M13) and Richmond roads in Pinetown. In total 27 people were killed, 24 at the scene and three at an area hospital. Investigators said the brakes failed on the truck, and prosecutors may seek to charge the trucking company as well. A dashcam video captured the crash. I will warn you that while it isn't explicit or gory, it does record people losing their lives, and it may not be something you want to watch.